The AL690 is great alternative to rear-loading hybrid lifts. 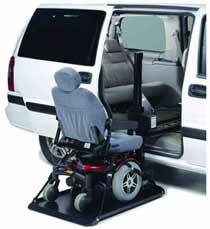 This convenient platform lift mounts to the 2nd row seating, and loads your powerchair or small scooter in through the side door of your full-size or mini van. This places the powerchair much closer to the passenger door (or driver door for a mini-van with left-side sliding door), which makes transferring much easier for those who have difficulty walking. The AL690 is fully automatic, and operates using the standard remote hand control. This makes loading your powerchair/scooter into your vehicle easy and efficient. No drilling, modifications, or special mounting devices required. Simply drive your mobility device onto the platform, strap it in, and let it do the rest of the work! The AL690 Hybrid lift is powerful, durable, and convenient. It provides a great solution to your transportation needs. Platform Size 17" - 28" adjustable width x 38"